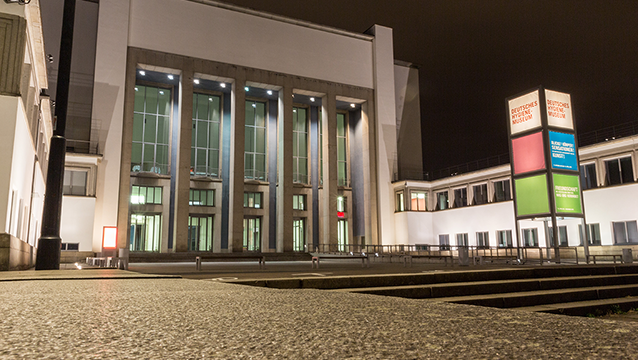 The Dresden Nexus Conference 2017 (DNC2017) opened on a high note at the Deutsches Hygiene-Museum in Germany today. 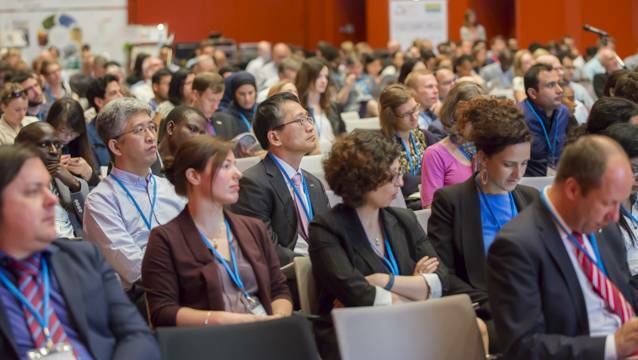 UNU-FLORES, the Technische Universität Dresden (TU Dresden), and the Leibniz Institute for Ecological Urban and Regional Development (IOER) welcomed 425 participants from 50 countries over three days (17–19 May). The biennial conference is in its second installation this year. Under the theme “Sustainable Development Goals (SDGs) and the Nexus Approach: Monitoring and Implementation”, Day 1 gave participants a broad overview of the issues related to monitoring and implementation strategies, particularly considering Multifunctional Land-Use Systems and Resources Management in Resilient Cities. 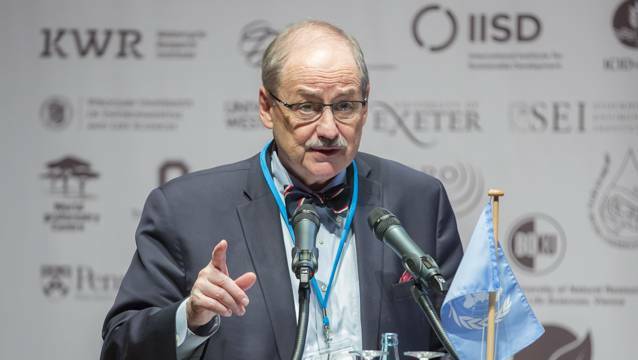 This year, participants can look forward to, among others, six keynote speeches, 88 oral presentations, 65 poster presentations, and six case studies portraying the use of the Nexus Approach as outlined in the introduction during the first plenary from UNU-FLORES Director Reza Ardakanian. 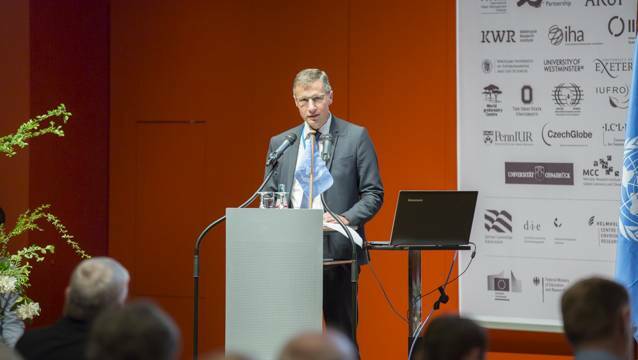 Following his welcome address, Karl-Heinz Feger (TU Dresden) introduced Uwe Gaul, State Secretary of the Saxon State Ministry for Higher Education, Research and the Arts (SMWK), who opened the conference by discussing the intentions and principles of DNC2017. 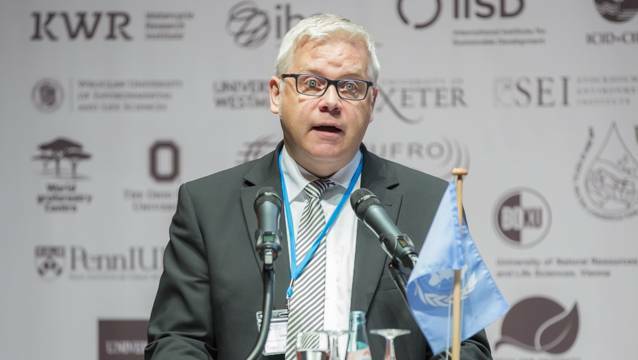 Bernhard Müller, Director of IOER, went on to introduce Detlef Klein, Senior-Advisor of the Water-Energy-Food Nexus Unit at GIZ, who delivered opening remarks on behalf of Tania Rödiger-Vorwerk, BMZ’s Deputy Director General for Environment and Infrastructure. This was followed by keynote speeches by Jerome Delli Priscoli, Chair of GWP Technical Committee and Nicola Fohrer, Institute for Natural Resource Conservation, Christian-Albrechts-Universität zu Kiel, including a lively Q&A session moderated by Wim van Vierssen (CEO, KWR Watercycle Research Institute and UNU-FLORES Advisory Committee Member). In his address, Jerome Delli Priscoli talked about how water resources are affected by climate change and the fundamental social means are affected by it and its resilience. 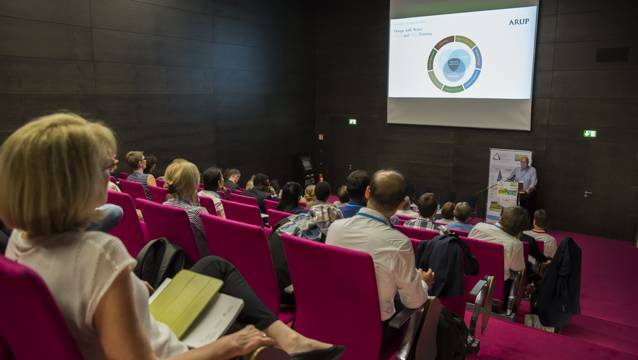 Addressing the second sub-theme, Nicola Fohrer delivered a keynote speech on multifunctional landscapes, highlighting that various resources are interconnected by their functions that influence water resources and land use. From 11:00–12:30 and 14:00–15:30, participants were free to attend eight different parallel sessions, each filled with oral presentations. 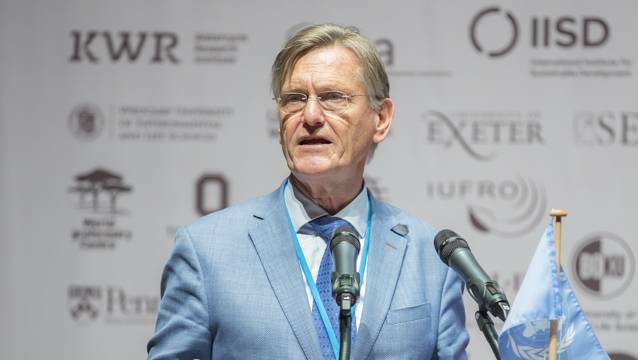 Under the first theme of Multifunctional Land-Use Systems, resource recovery and reuse was discussed from the perspective of the Nexus Approach – explored were the environmental, economic, and societal opportunities of wastewater use, the constraints and challenges in multifunctional land-use systems, and the roles of multifunctional reservoirs in the SDGs agenda. The parallel sessions under the second theme of Resources Management in Resilient Cities were geared at discussing cities and urban resilience vis-à-vis the nexus of various resources. Cross-thematic topics were also explored in the parallel sessions. Participants explored new and refined approaches supporting the implementation of a Nexus Approach, including knowledge management and transfer for its adoption and in so doing, achieving the SDGs. After the parallel sessions, poster presentations took place. At 16:00 participants had the opportunity to attend a side event launching the collaboration between UNU-FLORES and GIZ on developing a prototype of the Nexus Observatory and exploring further synergies that could emerge from greater integration of it with GIZ’s Nexus Resource Platform. The event was also livestreamed to remote participants via Facebook. All participants reconvened in the second plenary, where a Panel Discussion took place on case studies implementing the Nexus Approach in resilient cities. Christian Korndörfer (City of Dresden) presented on the climate change adaptation implementation in Dresden, Olfa Mahjoub (Tunisian National Research Institute for Rural Engineering, Water, and Forestry (INRGREF)) explained how wastewater is used as a resource in Tunisia, and David Vackar (CzechGlobe) spoke on stakeholder participation and implementation of climate change adaptation strategies in Czech cities. Moderated by Fritz Holzwarth (Rector i.a. 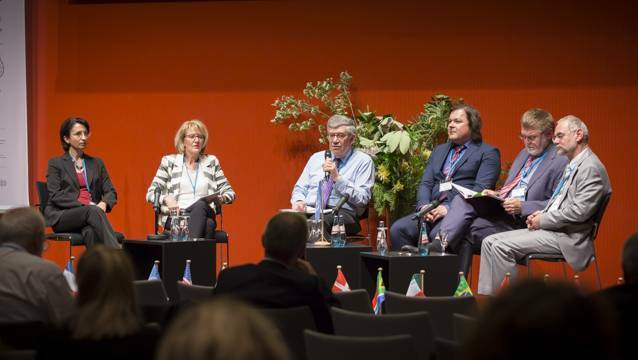 of IHE Delft Institute for Water Education), expert commenters Rudolph Cleveringa (Executive Director of Global Water Partnership), and Ruth Erlbeck (GIZ) joined the case study presenters for a very fruitful discussion. 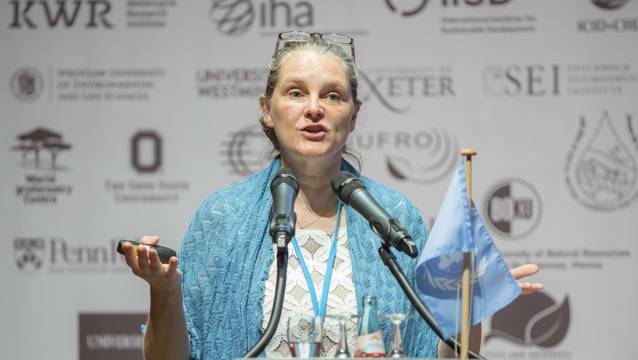 Among the main takeaways was the importance of involving stakeholders in developing and evaluating current and future adaptation measures – we need to ask ourselves who we have not yet reached and try to get out of our box. The SDGs offer a great opportunity to come up with innovative technologies and infrastructure projects that apply the Nexus Approach. However, technical solutions without good governance structures and monitoring approaches cannot succeed. Proper communication from science to policy is required so that decision makers can make use of the evidence provided. The first day of DNC2017 culminated with a welcome reception in the Ballroom of the Dresden City Hall, where participants were warmly welcomed to the city by Deputy Mayor Detlef Sittel. With the floor set, Day 2 of DNC2017 is set to be another rich and fulfilling series of discussions.